Today’s image for Day 349 of the VM_365 project shows a late Victorian/early 20th century Codd bottle manufactured for a soda water company from Broadstairs. Soft drinks bottles from other companies in Thanet have previously featured on Day 347 – Reeves & Co. Ltd and Day 348 – Philpott’s of the VM_365 project. Codd-neck bottles were used for carbonated drinks; their unique design patented by Hiram Codd of Camberwell, London in 1872, included a pinched neck enclosing a glass marble and a rubber washer. The bottles were filled upside down and the pressure of the gas used in the carbonation forced the marble against the rubber washer sealing the gas in. The pinched neck of the bottle incorporated a small chamber for the marble to move into so that it did not obstruct pouring. This clear glass example is from a company called Miller & Co. ,which is moulded along one side of the bottle, moulded on the other is ‘Broadstairs’. 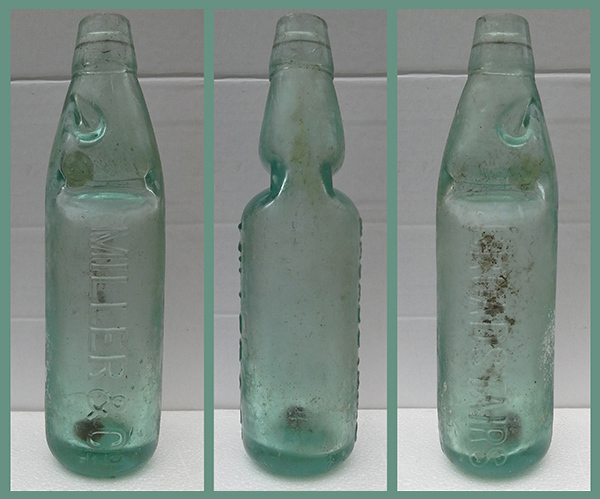 The glass marble and rubber washer are still intact which is relatively unusual for these bottles as they were often broken by small boys to retrieve the glass marbles! Glass marbles from bottles such as these used to be a frequent chance find on local beaches popular in the late Victorian and early 20th century and were also frequently found in fields used as Victorian rubbish tips. A clean water supply was important to our local towns in terms of hygiene and health both for locals and holiday maker alike and Broadstairs had been favoured with improvements to the town water supply in 1859 with the construction of Crampton Tower which featured on Day 262 and a new reservoir which featured on Day 263 of the VM_365 project. The image for today, Day 339 of the VM_365 project, is a north west facing view of the historic downland landscape of Birchington. The view of the horizon beyond the cornfields stretches from the complex of Glasshouses at Thanet Earth on the left side to the tree enclosed Quex Park on the right. All across this landscape in the ripening corn, the secrets of the archaeology below the ground are revealed in a mass of cropmarks. Some of the earliest images of archaeological sites revealed by cropmarks were aerial views of this very landscape published by OGS Crawford, known as the father of aerial archaeology, in the Journal Antiquity in 1934. Excavations in advance of the construction of the Thanet earth glasshouses gave an opportunity to investigate a set of the largely unexplored crop marks in the landscape. Archaeological features from the Neolithic, Bronze Age, Roman, Anglo-Saxon and even modern periods were revealed as each greenhouse was built. The Iron Age settlement of the landscape stretches far across the rolling hilltops and one of the most remarkable discoveries of the era was of a large hoard of Iron Age potin coins discovered when trees were planted to surround the newly enclosed Quex Park in the 1853. The remaining unexplored landscape almost certainly holds archaeological evidence of the same range of dates in the wide sweep of linear features and circular enclosures that can be seen in aerial views. Standing archaeology visible in today’s picture includes the spire of the Parish Church of All Saints at Birchington near the middle of the picture and on the far right the historic Gun Tower within the grounds of Quex Park. Beyond the horizon in the image is the coast at Minnis bay, whose remarkable archaeological landscape was itself explored on Day 334 of the VM_365 project. The image for Day 291 of the VM_365 project is of another of the burial associated with a small barrow, excavated at St. Stephens College at North Foreland, Broadstairs. The grave pictured was encountered at the base of the north western arm of the barrow ditch, adjacent to the narrow causeway entrance. The irregular,= ovoid grave cut, shown in the bottom right of the image, had been inserted into the base of the barrow ditch while it was still open. The south west – north east orientated grave cut was well defined with near vertical sides, slightly undercut at the eastern end and a flattish base. The cut measured only 0.7 metres long and 0.5 metres wide, with a maximum depth of 0.3 metres. 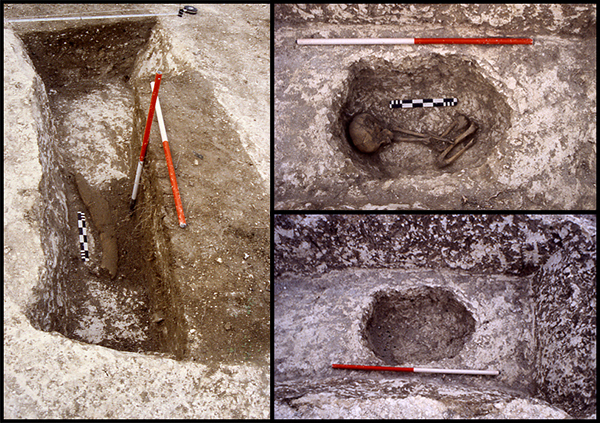 The upper right image shows how the skeleton had been placed directly on the base of the grave, before it had was backfilled with chalky sandy silt presumably derived from digging out the grave from the chalk geology. The deceptively small grave suggested that the poorly preserved skeletal remain were those of a child, however it appears that the person buried was a juvenile or young adult. The body was laid on its right side, in a tightly crouched position, with the head placed at the western end of the cut, facing south east. The tightly crouched position of the body suggests that the remains had been either bound or wrapped to allow the body to be placed in the small grave cut. A fragment of whale rib had been placed across the fill on the southern side of the grave cut, resting partly on the edge of the cut. More material had been mounded over the grave, covering the rib fragment spreading over the edge of the cut. It seems that the Barrow ditch was deliberately backfilled soon after the burial had been inserted in the base of the ditch to seal the newly inserted burial. The whale rib capping the grave raises some interesting questions about the form and meanings associated with the burial in the flat base in the terminal of this unusual ring ditch. Was the choice of a whale bone deliberate, perhaps having some symbolic value reflecting the waters at the junction of the North Sea with the English Channel that could be seen so clearly from the barrow’s location? Or was the rib fragment a more practical substitute for a timber to span the top of the grave to form a chamber, it wooden counterparts lost because they were less resistant to decay? 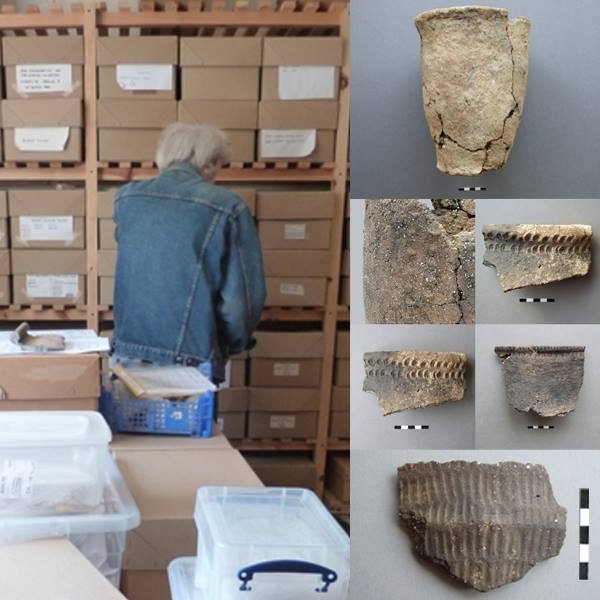 Whale bones may have been rare, carrying some cultural significance, or they may have littered a Bronze Age maritime settlement having been collected from the foreshore with other useful flotsam and jetsam. The VM_365 post for Day 30, which showed another image of this grave, gave some thoughts about how we try to understand the prehistoric remains that we encounter. Today’s image, for Day 267 of the VM_365 project, is the third and last of Dave Perkins’ reconstruction drawings, which show the progressive development of the landscape at Lord of the Manor, whose story has been revealed so vividly in aerial photographs and archaeological investigations and traced in the reconstructions shown on VM_365 Day 265 and Day 266. The complicated development of the prehistoric funerary monuments ended in the Late Bronze Age, with the insertion into the mounds of groups of pots and urns containing cremated human remains. The mounds of the barrows then stood in the landscape for many centuries, becoming overgrown with vegetation and diminishing through erosion. The prehistoric mounds were eventually overlaid by the graves of an extensive Anglo-Saxon cemetery. Perhaps the barrow mounds, as memorials of the older inhabitants of the area, continued to influence the choice of burial sites, but they may only have shown as rises and hillocks barely distinguishable from the surrounding landscape. In the later medieval period much of the Lord of the Manor landscape may have been ploughed as a rising population, recovering from the effects of the Black Death, created a demand for agricultural produce. Ozengell Grange, which is also close to the Lord of the Manor barrow group, was an agricultural estate owned by the Monastery of St Augustine, who farmed much of the land where the barrows once stood. The once impressive prehistoric monuments, which were designed to preserve the memory and display the power of the ancient inhabitants, were reduced by the plough over many centuries. There was no trace of the prehistoric monuments in the wide, flat and featureless fields that were left in the later 20th century, until they gave up their secrets to the archaeologists who were monitoring the crop marks each season and painstakingly plotting and investigating the sites they encountered. The image for Day 231 of the VM_365 project is of the portion of the ring ditch of a round barrow which was excavated at Bradstow School, Broadstairs in 2009. The image shows the regular series of segments taken out of the fill of the ring ditch to reveal sections at intervals around the circuit. The ring ditch is one of a group of four similar ring ditches which are distributed around the terminal of a dry valley where it meets the east facing aspect of a rounded chalk-downland hill, now occupied by the extensive grounds of the Bradstow school, formerly a private House called Valletta House. The Bronze Age landscape of the hilltop has been revealed in a remarkably extended series of investigations that began with an excavation carried out in 1910 by Howard Hurd, who featured in the post for Day 40. 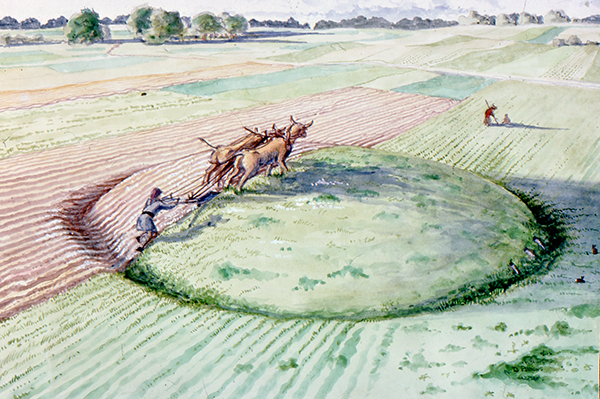 Hurd revealed a double ring ditch, probably representing a barrow that had been extended or refurbished at some time during its period of use as a funerary monument. 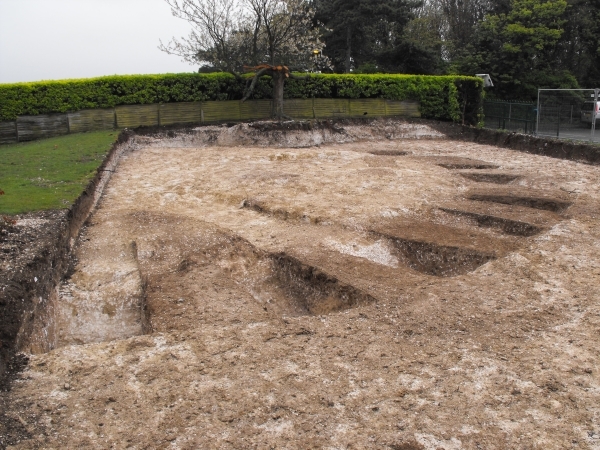 Two further ring ditches were recorded in excavations carried out by the Broadstairs and St.Peters Archaeological Society (BSPAS) with the assistance of the British Museum (BM), to the west and south west of Hurd’s excavation. The construction of a new facility for Bradstow School within part of the playing field in 2006, resulted in the discovery and excavation of a very large causewayed ring ditch, which may have been a ceremonial enclosure rather than a funerary monument like those that had been discovered by the earlier work. Nearby an unusually small ring ditch contained four graves, an unusual feature that does not fit into the conventional classifications of prehistoric burials in Thanet. When a former garden site standing immediately adjacent to the western most of the ring ditches recorded in the BSPAS and BM excavations was chosen as the location of a new swimming pool for the School, there was a further opportunity to explore the Bronze Age landscape of this Broadstairs hill top. Evaluation trenches revealed the circuit of another ring ditch, which was partly excavated before the pool was built. This excavation was carried out nearly a century after Howard Hurd’s discovery of the barrow under the lawns of Valleta House. The centre of the barrow where a primary burial might be expected was not exposed in the excavation. Two rectangular graves were associated with the ring ditch, one within the circuit which was severely truncated and contained no human remains. The other grave was perhaps inserted on the periphery of the barrow at a later date, it contained the remains of a child, lying crouched on its left hand side facing south, with a collared urn placed as an accessory vessel on the southern side of the skull. The ring ditch excavated in 2009, which had a diameter of approximately 24m continued the linear series of barrows that line the edge of the arc that is formed by the intersection of the dry valley with the hill top. Each point around the arc commanded a vista across the lower lying land and the sea, which may have been an important factor in the choice of location for these burial mounds in the Bronze Age and of the large causewayed ring ditch which stood very near to them. 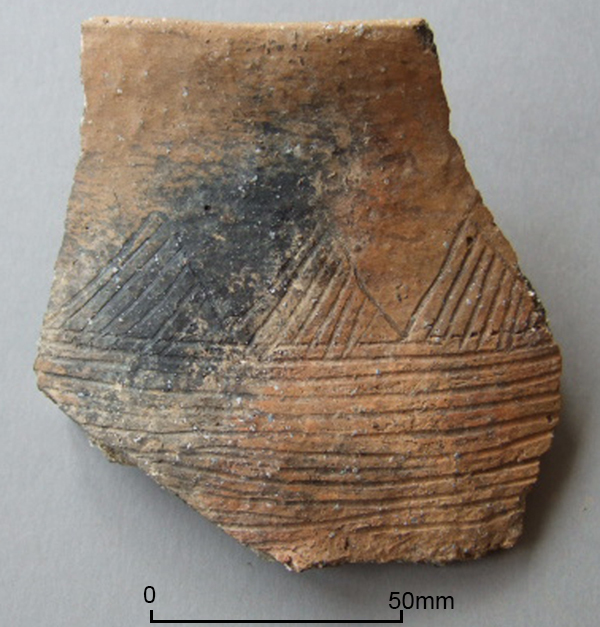 For Day 207 of the VM_365 project our image is of a large body sherd from a middle Bronze Age fineware globular urn showing the detail of the pattern of filled triangles above a series of horizontal lines scratched into its surface. The urn was found in the fill of a ditch at Hartsdown near Margate and was probably made between c.1550 and 1350 BC. The ceramics of the Middle Bronze Age period are currently divided into two periods, one spanning the period from around 1550-1350 BC and a period of transition into the Late Bronze Age from around 1350 to 1150 BC. The pottery of the first period is epitomised by coarseware barrel or bucket jars, frequently with thick-walls, of the ‘Deverel-Rimbury’ style. There are also small tub or bowl forms and thinner walled finewares; ‘globular urns’ and beakers and small jars that were probably drinking vessels. Sometimes much larger versions of these forms were made. All of these were flint-tempered fabrics. In the second transitional period there are some changes in shape, to some degree large heavy-bodied coarseware jars and tub forms continue to be made. A new form typical of the transitional period is the hooked-rim jar, frequently with perforations below the rim. Vessels with mixed tempering, with both grog and flint in the fabric, are fairly often present. Globular Urn vessel types tend to disappear, replaced by other vessels like the Birchington bowl which contained the Bronze hoard shown on Day 199 and the stamp-decorated jar shown on Day 201. Today’s image shows the front and back views of a jet button that was found within the same grave as yesterday’s plano-convex flint knife from Manston, near Ramsgate in 1987. The jet button was found resting on the floor of the grave to the west of the skull. 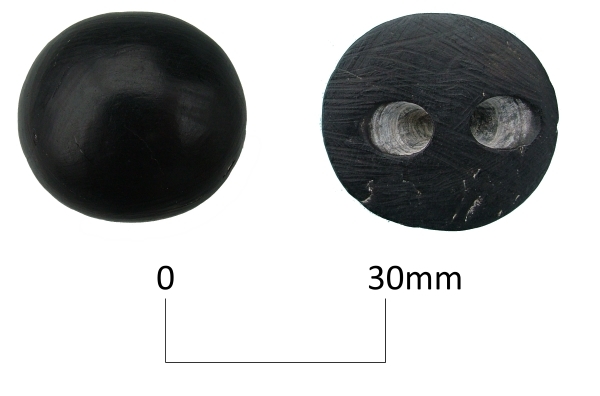 Jet buttons of this ‘V’ perforation type that are also associated with a flint knife and a Beaker vessel are known as far afield as Devon, Berkshire and Wiltshire. Today’s VM-365 Day 141 image is of an Early Bronze Age, flint, barbed and tanged arrowhead found during excavations by Thanet Archaeological Society at Lord of the Manor, Ramsgate in 2012. This example is almost as pristine as the day it was made, is unpatinated and has a date range of c. 2300-1600 BC. It is missing its left hand barb which may have been broken whilst it was being made. 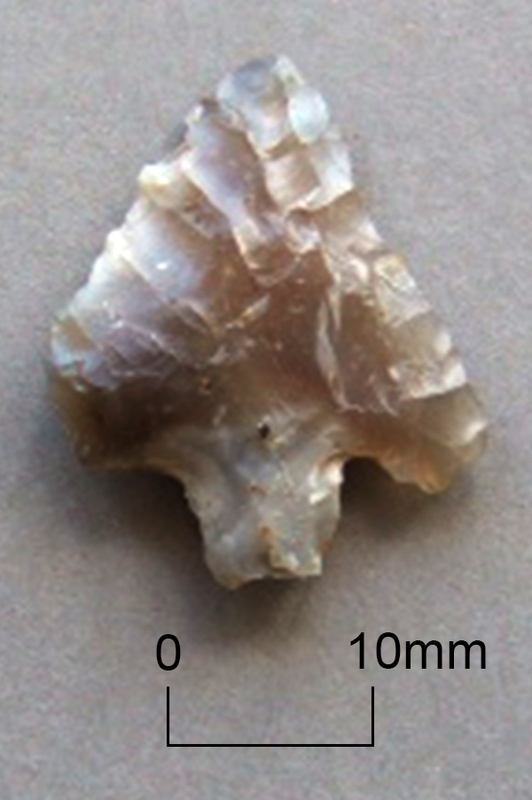 The arrowhead was found within the topsoil while cleaning the stripped surface of the site prior to excavation. With thanks to Nigel Macpherson-Grant for supplying the information and photo.